The Temporal Turbine is a Shadow type weapon. Desolate and disheartening, this trap paints a picture of a bleak and meaningless existence, even when observed in its resting state. When a mouse approaches, the Temporal Turbine beings to hum, spinning violenty and churning impossibly dark clouds, forming a direct link with the depths of a void in space beyond our plane of existence. Once the mouse begins to gaze into the contraption, the turbine links with the mind of the mouse, implanting the image of a mouse utopia, convincing it to surrender itself as it astrally-projects the soul of the mouse into space, leaving behind a dormant husk, never to return. The Temporal Turbine is not sold by any Trapsmith. It can only be crafted given the proper ingredients. 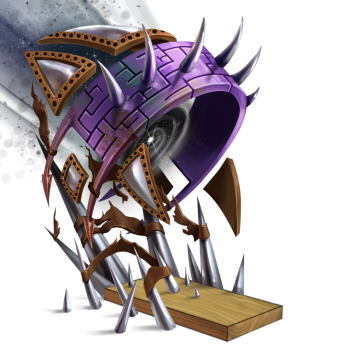 9 September 2015: The Temporal Turbine was introduced as part of the Hollow Heights release. 25 July 2017: The Temporal Turbine can be smashed to create Temporal Turbine Trap Parts which is used to upgrade to Chrome Temporal Turbine. This page was last edited on 27 January 2019, at 01:00.